Aviator is a company that helps connects students, parents and businesses for gap year job shadow programs. 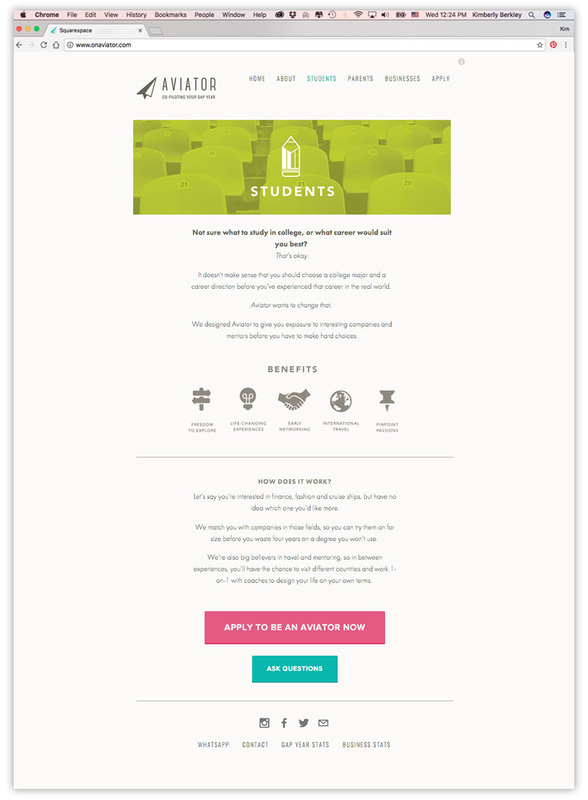 I designed this website on the Squarespace platform in partnership with client Andrea Wien, author of Gap to Great, a parent's guide to the gap year to guide users on more info about gap year programs. The website is no longer running due to Andrea's change in focus but you can check out below's images to see what once was and to see examples of my web, branding and icon design. for more on this project go to the Logos page. 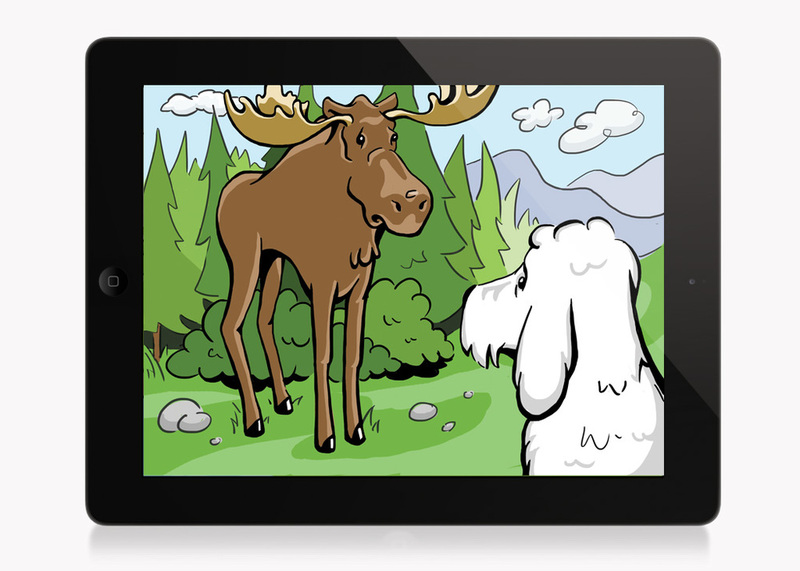 Illustrated visuals for IPad game designed to help Occupational Therapists incorporate physical therapy in a fun way. The game are design to help with small motor function and hand coordination by dragging, pinching and tracing. Look in Logos and Digital Illustration for more with this brand, or for more info check out doodletherapyapps.com. After doing complimentary rebrands for these sister restaurants, I design complimentary websites to suite both having a similar layout but unique elements that mimic their characters. The ridgeback being a lighter and softer feeling place got serifed type and a light color scheme, while the Hangar with a more industrial design got sans serif modern type and an earthier color palette. See Logos, Branding Collateral, Chalk Sign Art and Painted Sign Art for more with this brand. After designing the identity for this app I took that look and feel and extended it to the app's website. We wanted it to be calming, proffessional and have features that nod to a cars aesthetic. We did this with leather textures in soothing colors, embroidered text and pops of orange to highlight important info. The design was then handed off to deveopers for online construction. See Logos for more of this brand. Adam Lashinsky, author of a book on the Apple computer company, needed a website that fit the style of the book design. I designed this site as an option to be presented to the client and developed by web developers. Look in Logos, Packaging, Chalk Sign Art and Painted Sign Art for more of this brand. Designed visuals for Iphone Ad pop up advertising various apps amidst other apps including buttons, scroller and background. Needed to work for a variety of Apps with their own icons, and text content. This design was sent to developer for final build and implementation. Website design for Photography studio in accordance with designed branding and print collateral. Design needed to be bold and hip yet simple enough to showcase photos without distraction. Chose a gray color palette with red/orange pops to balance neutral with excitement. Text was kept minimal and modern while decorative elements were brought in to keep brand consistency, including background shape. Look in Logos, and Branding Collateral for more with this brand.